It has been a week of storms. First came the rain and the wind. Followed by a heavy, wet snow. Thousands without power for days. I took my dog for a walk this morning. And to run through the snow. Calling back and forth to each other across the field. The warmth of the spring sun slowly melts the snow left by last week’s storm. 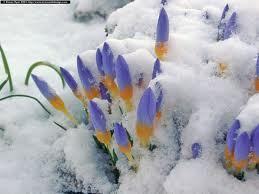 Yet, in the corner where the snow has already melted the first flowers of spring push their way above the ground. My prayer for today is this. May I lift my life towards that spring sun and allow it to melt the frozen parts within me. Push its way towards the surface of my life. Sometime each morning I find myself standing at our kitchen counter looking out the window onto our back yard. Often as I finish the last of my coffee before I walk the dog and go to work. For months the view out my window has either been the dirty white of old snow or the shriveled brown of dead grass. And, for the longest time this year, patches of dirty snow lingered in the shaded corners of our yard. For the first time in months, just a hint of green was visible. For the sun and the breeze to change for cold to warm. The forsythia will soon follow. Then the trees and then the lilacs. For the last several weeks of the winter my spirit mirrored the view outside my window. I long to be like the grass. Attentive to the change in the breeze. Ready to come back to life. This morning it was 11 degrees when I walked out the door. My breath hanging in the air. Cold breeze against my cheeks. Snow still covering the ground. Unseen cardinals calling to each other. Beginning tomorrow and continuing into Monday, another snow storm is predicted for where I live. 6-8 more inches on top of the snow that we already have had much of which is still on the ground. I generally don’t mind the snow. I love the beauty of the snow on the trees. But, I am very ready for spring. Not just to melt the snow, but to call a part of me back to life. My interior life is beginning to match the weather outside. Bundled up in an effort to stay warm. I need the warmth to peel away the layers and to pull life back towards the surface. I need to be outdoors. And, to walk and to run and to play. I need to see green rather than just grey. “To everything there is a season…” the ancient preacher wrote. It snowed yesterday and I am sure some of my neighbors are still digging out from the storm, but there is something different about today. Instead of the damp, chill of winter, there is a touch of warmth in the breeze that hints of spring. And, this morning on my walk, for the first time this winter, I heard the call of a cardinal. I even love winter when air is so cold that you see your breath and the night sky is so clear you see not just stars, but the Milky Way. But, I am ready for winter to be over. I am ready to open the windows. I am ready for the spring breeze to clear out the mustiness in our house and the mustiness in my head. I am ready to take off my coat and to feel the warmth of the sun on my skin. I know there are going to be many more days when there is more chill in the air than warmth, but today the breeze holds the promise of change.